Tolls to cross the Severn bridges into Wales have officially been scrapped after 52 years. 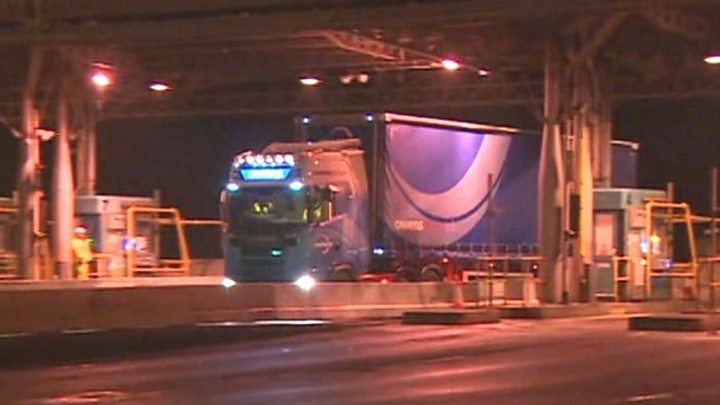 The first lorry made its way across the Prince of Wales Bridge for free just after 06:30 GMT on Monday. 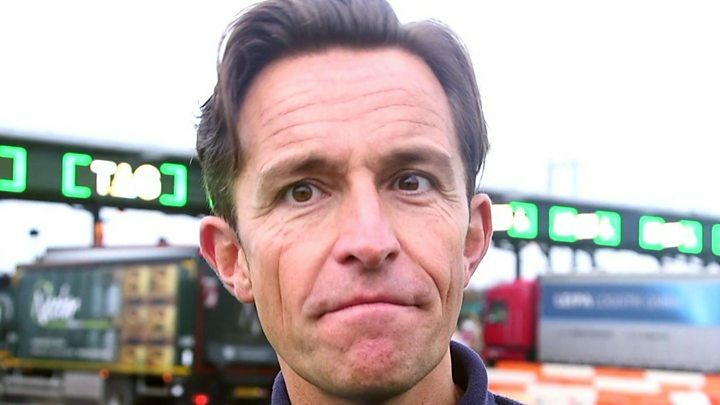 "It feels fantastic - the first time ever to cross the bridge for free - it's an exciting moment," said haulier Craig Evans as he passed the dismantled toll booths. The two bridges see 25 million journeys across the Severn every year. The removal of the fee, which was £5.60 for a car, on the M4 and M48 bridges between south-west England and Wales may save commuters up to £1,400 a year. It is predicted the toll removal will give a £100m boost to the Welsh economy but 100 toll collectors and administrative staff have been made redundant. The UK Government has estimated that toll removal could see traffic rise by six million more vehicles a year which could increase congestion further along the M4 at Newport's infamous traffic bottleneck, the Brynglas Tunnels. The Welsh Government predicts toll removal will increase traffic by 20% over the M4 bridge - adding an extra 7% of traffic at the tunnels, a stretch already dealing with double its vehicle capacity. 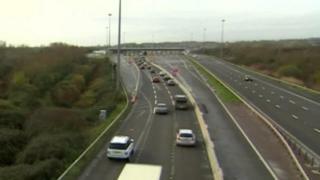 But scrapping the Severn toll has been welcomed by businesses who claimed the "tax" was a barrier to trade. Transport Secretary Chris Grayling said it will "help transform" the Severnside economy. Demolition of toll booths on the M4 Prince of Wales bridge has begun and three lanes have been re-opened, with a 50mph (80km/h) speed restriction on temporary narrow lanes. The M48 original Severn crossing between Chepstow and Aust is now closed until 07:00 GMT Wednesday, for the tolls to be dismantled. The Queen opened the first bridge in 1966 and it is the first time in history for most travellers that being able to cross the Severn Estuary that separates Monmouthshire and South Gloucestershire is free. Welsh Secretary Alun Cairns, who paid the final toll over the second crossing on Sunday, said: "The end of the tolls is a major milestone for the economies of south Wales and south-west of England, and will remove historic barriers between communities. "Scrapping the tolls means an end to generations of people paying to simply cross the border....meaning more money in their pockets, helping them with the cost of living and leaving them with more cash to spend in their local areas." The toll removal has seen the ripple effects of the booming Bristol economy, reported to be second only to London in the UK, in south-east Wales. Average house prices have already risen faster in the two Welsh Severnside towns of Chepstow and Caldicot than in any other UK town. The toll on the M4 and M48 bridges - paid as drivers head westbound into Wales - was initially reduced on New Year's Day in 2018 after they returned to public ownership. Wales's previous First Minister Carwyn Jones had called for the toll, which is worth up to £10m a month for the UK Government, to be scrapped straight away on 1 January 2018. But the Department for Transport said the fees collected in 2018 would help pay to phase out tolling and pay towards the estimated annual maintenance and operational cost bill of £15m. Image caption "Where things get a little more tricky for ministers in Cardiff Bay is how they intend to cope with that extra traffic." The UK Government and the Welsh Government do not agree on many things these days. But ministers at both ends of the M4 support abolishing the tolls on the Severn bridge. They also agree that traffic flow will increase on both sides of the bridge when the tolls go. Where things get a little more tricky for ministers in Cardiff Bay is how they intend to cope with that extra traffic. In the past they have said it was part of the reason the M4 relief road is needed. But as the future of the £1.4bn scheme hangs in the balance, the extra vehicles using that busy stretch of road could cause more of a headache for motorists.